Going back to Manila from Bolinao, people rarely take the Zambales route obviously because it's longer. But you are missing a lot if you've never passed this road. 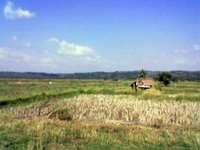 Indeed, it provides one of the best views of the Philippine countryside as well as the beaches along the South China Sea. So if you have a lot of time to spare and extra funds for gas, I suggest you give it a try. From Bolinao, I was planning to pass by Alaminos again to try the quarterpounder at McDonald's which many of my brods claim is the best they've tasted. On the way, I was curious to take a look at the island municipality of Anda which could be accessed by a long bridge somewhere between Bolinao and Bani. 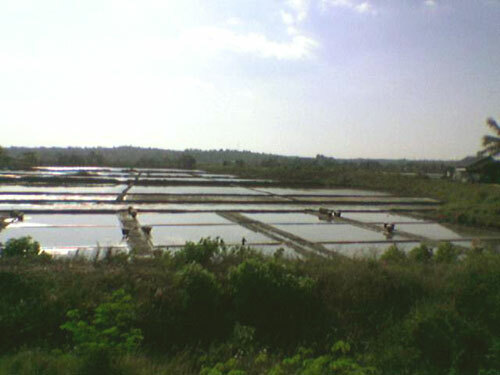 Except for the view from the bridge and the white sand beach of Tondol, nothing much to see in Anda. So on I went. For some reason, I missed the turn to Alaminos and ended up in the faster route to Zambales. I guess it was a blessing in disguise. 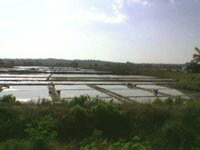 From Bani, I passed by Agno, Burgos where I took photos of the Gabaldon school building, Dasol which was a salt producing town, and finally the last town of Pangasinan, Infanta. All these towns were by the beach and there were a lot of small resorts along the road. Imagine the potential of these pristine beaches! The first town upon entering Zambales was Sta. Cruz. I was pleasantly surprised to see so many old houses still intact, in fact they lined-up along the streets one after the other. And the coral Church of St. Michael the Archangel was just perfect (except for the modern interior). Although the houses were neglected, if restored properly, Sta. Cruz has potential of becoming another heritage town and a showcase for Zambales. Which is why I immediately contacted Vice-Governor Ramon Lacbain II, who is a SSEAYP alumnus like myself, to check if he was in town. Great! He was free to meet me in Olongapo City. The next stop, actually one of the main reasons I took the Zambales route, was Masinloc. 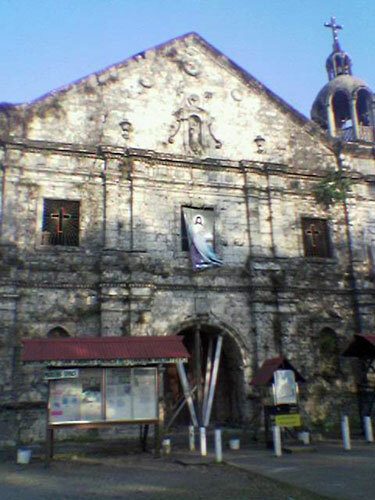 Its church was declared a national cultural treasure in 2001. But when I got there, all the doors were locked since the structure is currently being restored by the NHI. A personal disappointment since I did not get to see the interior but very good news for heritage. After all that bad news I saw in Pangasinan, here was a perfect example of the proper management of a heritage church. The formula is simple, get techinical support from the experts! What's wrong with asking for help from those who know what to do? In the government, you have the NCCA, National Museum and the NHI. From the private sector, you have groups like the Heritage Conservation Society. 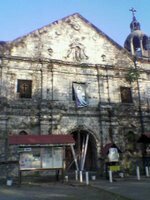 Thumbs up to the Masinloc's San Antonio Church Restoration Volunteers headed by Fr. Ernie Raymundo, which is currently raising counterpart funds from citizens of the town. I also commend Sen. Aquilino Pimintel for releasing P4.76 million from his CDF to fund the restoration of this 1607 church which was badly damaged in a December 1999 earthquake. For those who want to donate funds, you can call telephone no. (63 47) 8215678. It was getting dark and I still had two churches to visit. It was another 45 minutes from Masinloc to the provincial capital Iba, which is the birthplace of former president Ramon Magsaysay. 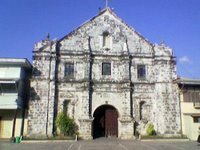 There are a lot of old houses around but I didn't have much time to explore so I just took photos of the1703 Cathedral of St. Augustine, the seat of the Diocese of Iba. The current bishop, the Most Rev. Florentino G. Lavarias, D.D. 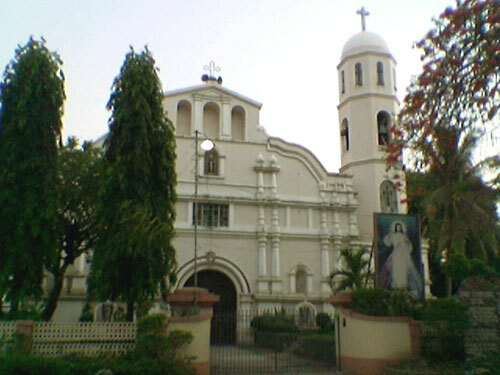 was a former parish priest in San Fernando, Pampanga. A few minutes away was Botolan. 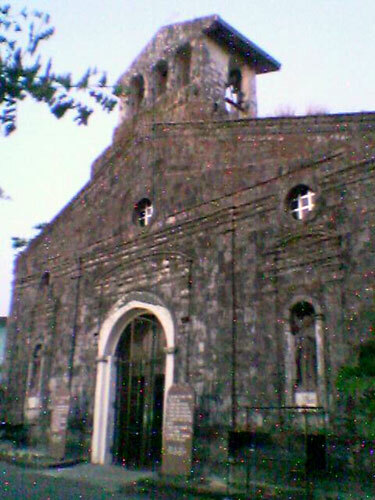 It was quite dark but I was able to get a shot of the small coral Church of Sta. Monica. It was then that I realized that I had not eaten at all! I guess I was just too excited with my trip. So I stopped over at one of the towns to rest when I saw a Mister Donut sign as well as an internet shop. It turns out, it was San Narciso, which breaks were quite popular among surfers. To make the long story short, I reached Olongapo at 8 p.m., close to five hours after I had left Bolinao! So it was straight to Sam's Pizza where the vice-governor was waiting for me. The chicken teriyaki pizza I ate was great. We were able to tackle a lot for tourism in Zambales. I'll let you know about the plans when they've all been firmed up. But definitely, the plans are exciting and grand. I got back in Pampanga at 1 a.m.
Time for me to rest now. I'm flying to Cebu at 7 a.m. tomorrow. Yipee! Another whirlwind adventure, this time in Central Visayas. I plan to visit five provinces in six days. Hehe! I hope I make it to all. Nice. I love adventure and reading such give me fleeting moments of freedom even if I'm reading this in the confines of my cubicle. Keep it up and i hope to read more of my beloved Pampanga. Thank you so much for finding time to visit Zambales and for admiring our beautiful tourism sites. I wish you can come back very soon and see more of our tourism and get the chance to interact with our people. I am also excited to work with you to realize our plans to make Zambales a tourist destination not only because of our beaches and natural resoruces but also because of our preserved cultural heritage. Good luck to all your endeavors to promote the Philipines through your peronal efforts and your beautiful blog throughout the whole world. Thanks vice! Hope to see more of Zambales when I get back from my visit to our SSEAYP friends. Hi Lourdes, as I mentioned in my entry, a potential tourism destination is Sta. Cruz. We simply need to get all these old houses freshly-painted. 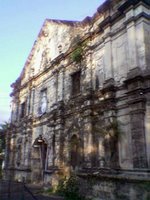 It can become a backpack destination (a stopover on the way to Bolinao) if many of these old houses are converted into guest houses. San Narciso is another possibility with its popular surf area. And finally, there is Capones Island. You can arrange day cruises from Subic or San Antonio. Visitors can visit the beaches, the centuries-old lighthouse, or the turtle conservation program, or engage in water sports and scuba-diving. A lot can be done if Zambales unites and does things towards that direction. I just started blogging a few days ago and stumbled upon your blogs. I must say I'm really impressed. I visited the visitzambales.com website and it is nicely done! Although I think somebody forgot to include Surfing as a tourism attraction. Surf Tourism is a big industry especially with nearby surf countries such as Japan and Australia. Would be great and a good boost for Zambales tourism if you could promote Surfing in all your PR campaigns. We are operating a surf school in Zambales during the weekends currently catering to Manilians. So far there have been a lot of interest and if only Zambales would promote surfing, we could see that the next Surfing boom can happen here as happened in LaUnion before. Plus, it's only 2.5 hours away from Manila. Love the photos. I'm get homesick everytime i go through your blog. Thank you for having visited Zambales. I am a Zambaleno from the small town of Cabangan, the next town from Botolan going to the south. My family from the generation of my grandfather were mostly born in that small and peaceful town. My grandfather's parents(my greatgrandparents) were from Magalang, Pampanga, and that is the reason I sometimes hear some of my folks speak Pampango in our house from time to time when relatives from Pampanga visit us. I take pride too that I have kapampangan roots. I am into research of my genealogy on a not so regular basis, but still continues when I have time to do so. My greatgrandfather was the first Presidente Municipal (1901) of Cabangan when it was separated from its mother town of Botolan. His name was Benito Rivera. He was born in Magalang in 1870 and died in Cabangan Zambales. I do not know why he came to Zambales and if he originally came to Cabangan or Botolan. Sometime in the 1860s there was a pueblo in Botolan named San Fernando de Rivera. I was wondering if you came across on this pueblo in your researches. I have a feeling that this was the place where my greatgrandparents originally settled in Zambales and believd that the original settlers of this pueblo were from Pampanga which includes my greatgrandparents of the Rivera clan of Magalang Pampanga. Unfortunately this pueblo is not in existing now since the late 1800s. The only reference I read of this pueblo is from the baptismal records from the town of Botolan. My greatgrandfather was married to a Limcolioc (Cecilia Dizon Limcolioc born on 1872 in Magalang, Pampanga too). I read in the web sometime ago that there was a Limcolioc who married one of the sisters of Servillano Aquino of Pampanga. Also it is interesting to note that the former mayor of San Fernando, a Pamintuan is a Limcolioc descendant. If you have time could you shed some light to this info or share with me any little info you come across. Hi Gilbert, I suggest you visit the Center for Kapampangan Studies at Holy Angel University, Angeles City. They could help you with the information you need. hi Ivan ...i was so surprised to read your postings on Zambales. i was encouraged to write to you after reading someone's posting who is also from the small, quiet & sweet town of Cabangan. My mother was born & raised there ...she is from the Alinea family there. Growing up, i spent a few years of my school days there ...although, i was born & baptized in San Antonio I grew up in Olongapo City when my father got employment on base of the U.S. Naval Subic Base. It was indeed a blessing in disguise that you missed your turn to go to your intended destination ...thus, you discovered my province of Zambales that also has breathtaking sea shore panorama. Please go back there again and help us promote our province to tourism. THANKS forall your good work ...not only in promoting a town/province/community and what have you, but specially in helping to photograph & chronicle sites/structures that needs to be saved or preserved. God Bless you, Ivan, and more to you and your group. You actually missed something great in Zambales, hopefully you go back during the Mango harvest season - March to May particularly from Palauig, north of Iba, also try the pure Carabao's Milk "Pastillas" from Baranggay Liozon, Palauig. i am grace alinea belano of cabangan, zambales. i have a beach house for rent located at brgy. loaog. i am also a real estate agent. this is my no. 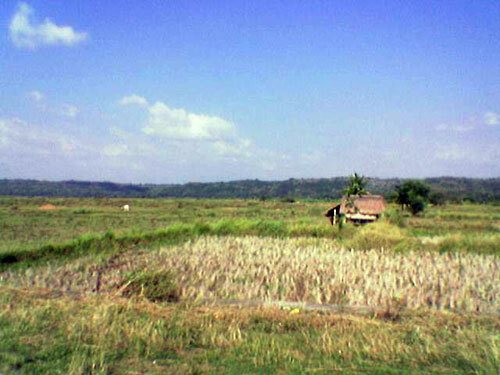 if there be any wants to invest here in zambales.. farm lots/ beach lots/ residential- commercial. cabangan is a retiring place.